Senate, airport, train stations, cities: students have stopped the country fighting education reform and the cuts to education! 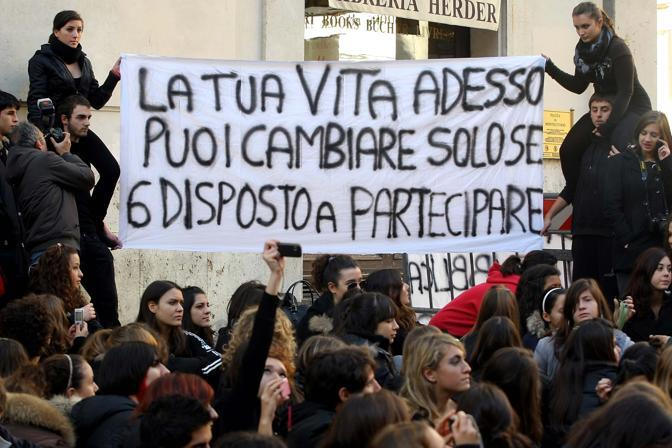 These are very intense days in Italy: final cuts to the university has created a huge mobilization all over the country. Tens of universities, more than 200 schools and even more colleges are going to be occupied this night: if Parliament is going to approve the education Reform, students will go on occupying everything. An entire generation is rebelling against the destruction of the university and the dismantling of research. We reclaim for welfare and free research against debt and lobbies, we want funding for education and university to create our own future, we block university and city, we reclaim our future! We threw eggs at the office of the national conference of italian rectors (CRUI): we did that because this association is the strongest supporter of this reform. Then the 'wild demo' went toward the Senate House, throwing eggs and assaulting the main gate trying to enter: "Resignation, let us enter, give us back our future" shouted students. During the 'wild demo' students used culture to defend themselves: Samba and "book block" tried to defend students' right to dissent, receiving a violent reaction by police. Students defended themselves just with the books (yes, using giant books..). After numerous clashes, when the demo was going, some students were arrested and several hurt by police. Photos of Book block and police charges HERE and video. Students decided to do a sit in, asking for the liberation of the arrested. After two hours we went back to the occupied universities to make an assembly, organize support to students and plan the next days of mobilization. In Pisa students moved this morning from the seven occupied colleges, a wild demo has blocked all the bridges of the city, stopping entrances, and then 3,000 students reached the airport stopping all the flights. Flash mobs and lessons in the squares took place all night long and the Rector's office has been occupied, both in Pisa and Florence. Photos and video from Pisa here. In Padua a wild demo blocked the city, university has been occupied and police charged students. In Turin students blocked the main train station and in Bologna, after a wild demo the Rector's office has been occupied in solidarity with students arrested in Rome. In Rome, Milan, Turin and Perugia researchers and students occupied the roof of universities. In London, twenty thousands students walked out crying "We are the future, think twice", as in Rome, Dublin, Paris and Madrid last month protests took place in different ways. Young people all over Europe are shouting firmly that we are the future and not the responsible of the crisis, we refuse any kind of austerity, blocking all the production and the centre of decision. EU and european governments are creaking, they are not able to contain social dissent and students indignation: welfare, funding, independent research are the only answers we can accept from governments who want to destroy our life and future.